Hercules and Cerberus, Photograph by Maria Daniels. 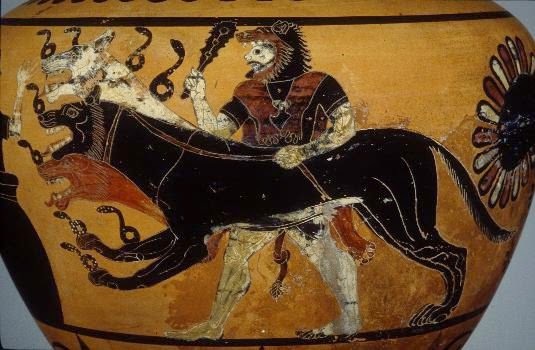 Cerberus, offspring of Typhon and Echidna, was a massive three-headed dog with a mane of snakes and a serpent's tail. In Greek and Roman mythology, Cerberus guarded the entrance to the Underworld, allowing the deceased to pass through the gates. A few brave souls, like Orpheus, managed to sneak past Cerberus into Hades after lulling the beast to sleep, but no spirits were allowed to return to the upper world on his watch. When Hercules went mad at the hands of Hera and murdered his sons and wife, he sought penance. The Oracle at Delphi informed him that he should report to King Eurystheus to serve for twelve years. Hercules was advised that, during this period of service, he should undertake any task the King wished. Hercules initially completed ten tasks, two of which were deemed invalid by the King for various reasons (in one, Hercules intended to accept pay for the completion of said task, and the other was completed with assistance). As a result, two new labors were set, the final of which was to capture Cerberus. Hercules proceeded to sneak into the Underworld in search of Hades to ask Hades if he could borrow Cerberus for a bit. Hades agreed on the condition that Hercules capture the animal without weapons. Hercules was cool with this condition. Within short order, he overpowered Cerberus and dragged him back to Eurystheus. Eurystheus was duly impressed, and quite possibly terrified of the massive beast. He fled, requesting that Hercules return Cerberus to the Underworld. Upon completion of this task, Eurystheus promised to free Hercules from his service.